By ERIC SCHELKOPF Gary, Ind.-born Donald Kinsey has never forgotten his blues roots. Kinsey's dad, the late Lester "Big Daddy" Kinsey, instilled the blues in him and his brothers, Ralph and Ken, who would later join forces to form The Kinsey Report. 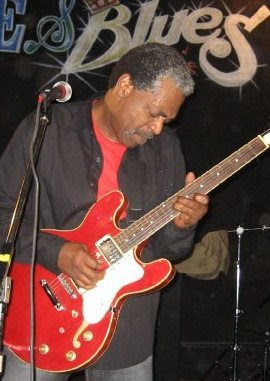 Donald Kinsey, www.donaldkinsey.com, took a musical detour after hooking up with reggae legends Bob Marley and Peter Tosh. These days, he is with his brothers again on stage, and The Kinsey Report is working a new album, the band's first since 1999's "Smoke and Steel." The Kinsey Report will perform July 19 and 20 at Kingston Mines, 2548 N. Halsted, Chicago. Tickets are $15, available at www.ticketweb.com. I had the chance to talk to Kinsey about his illustrious career and his current activities. Q - Is it still special playing with your brothers? Oh, yeah, without a doubt. Q - What makes it so great for you, being with your brothers on stage? A lot of times when we play, I reflect back on when we were all kids, and the sacrifices my parents made in order for us to be able to do what we do. The fact that we're still doing it and honoring our father, it's a good feeling, you know. Q - At your shows, do you see a lot of longtime fans? Oh, yeah, absolutely. That's one of the greatest things, you know. It's been an awesome feeling to see people who have been following the music. It's really something to be thankful for. Q - Talking about your dad, Lester "Big Daddy" Kinsey, what was it that he gave you that made you want to be a musician? You know, my dad and my mom, they were both born in Mississippi. Those were his roots, growing up in the Mississippi Delta. And he made sure we knew about his roots. Every summer, from the time we were in elementary school, he would take us down to Mississippi and we were stay with my grandparents. My dad would take us to places where he grew up and roads he walked down. He would just show us his playground down there, and my mom as well. This was where the blues were born, and that's where my dad got the first taste of the blues. To tell it in his own words, he snuck out of the house one day, and went to a little juke joint, and heard Muddy Waters for the first time. He tried to remember that sound and what Muddy was doing until he could get back to the house and grab his guitar and try to reproduce that sound. It just captivated him. Him and my mom, they got married, and they came north. They were married for seven years before they had any kids, and they wanted kids really bad. And then God blessed them with three kids. It was like a dream come true for my dad that he had sons. He put me in his lap and put the guitar strap around my neck, and started showing me about the guitar and stuff. And my brother Ralph, he was taking the butter knife and tearing up all the chairs, so he turned out to be a drummer. And then Ken, my younger brother, he was seeing this all growing up. When Ken was born, Ralph and I were doing shows with my dad. We were 10, 11 years old. Fridays and Saturdays, we would play at the Elks Club or somewhere, and then on Sundays, would play at church. That was my life, all the way until I came out of high school. When we play today, I think about all of that. I think about all those nights of rehearsal, and musicians that my dad would invite over to the house and show us things, and all the after hours clubs that he would sneak us into. My dad introduced us to people like Muddy Waters and Howlin' Wolf and I had the pleasure of working with Albert King at the age of 17. Q - When you were playing with your dad's revue, you became known as "B.B. King Jr." That must have been quite the honor. Did that go to your head? Oh, no. I listened to a lot of B.B. King. Back then, radio played more blues. B.B. King would have a hit record out every other month, you know what I mean? What happened was, we played this club in Memphis and met this lady who was somehow related to B.B. King. She suggested to my dad, "You should call that boy B.B. King Jr." Q - You were hired to go on the road with Albert King at the age of 18. Was that overwhelming? Was that a dream come true for you? It was the way God wanted my path in life to go. I knew from the age of 16 that I wanted to commit to music. When I got out of high school, I went to get a job at the steel mill. I wanted straight days and to be off on the weekends so I could rehearse and do shows on the weekend. It got to the point of where they wanted to take me off day shift. My dad told me to do what I wanted to do, so I quit the steel mill. It wasn't long after that that we were playing a show in Gary, and Albert was in town, and he asked my dad about me going out on the road as his rhythm guitar player. It all happened so fast. I was with him about six months, and then I became his band leader. He told my dad, "Big Daddy, don't worry about him. I'll treat him like my son." It was to the point that he was actually introducing me as his son in some places. Q - What did you learn from the experience? Oh, man, I learned so much. Being a band leader is a big responsibility and a very disciplined position. There's a lot to that position. It touched my life in a lot of ways, not just musically. He trusted me. He knew that I was there for him. I wasn't just there for the job that I was hired for. It was more than that. This was in the early '70s, and I got the chance to do shows with Freddie King and Professor Longhair, and also it took me around the world. It was a heck of an experience at age 18. Q - Was it hard making the switch from blues to reggae? Not really, because of my gospel roots. Playing in my grandfather's Pentecostal church, music was very much part of the church. Reggae music has a more gospel feel to it, at least the music I was introduced to. It had a more spiritual message and spiritual consciousness. The thing that I had to really kind of work on was the downbeat, the drop of the beat. I wasn't used to that. But the spirit of the music and the flavor and the soul, I had that. And I think that's what they were looking for in me, my bluesy style, my bluesy gospel style of playing. Q - I understand that you introduced Bob Marley and Peter Tosh to rock 'n' roll, and then Peter Tosh went on to do a version of "Johnny B. Goode." That's my arrangement. I love doing that kind of stuff. For Peter to do it, it had to totally become Peter's song. I could see it fitting Peter's image. It's just talking about a kid that wants to be successful playing his guitar, playing his music. The bass line came to me, and the vocal melody came to me. I wanted to see the music be successful. Reggae at the time was just coming into America. Eric Clapton had did "I Shot the Sheriff" and all that stuff. But we were still breaking ground trying to bring this music forward. We were still looking for some type of commercial appeal that could break this music through. And that version of "Johnny B. Goode" became like one of MTV's most 100 played videos. It was really a trip, man. I'm thankful for having been a part of that era, and helping to bring that music forward. Bob and I, we got to be really close. One night after a show at The Roxy Theatre in Los Angeles, I was showing him some old blues stuff, and we were singing some old Temptations harmonies. Bob was trying to sing a blues melody. We just got a chance to really bond. Down in Jamaica, he would come and pick me up in the morning and we would go running on the beach. It was about being healthy. Hooking up with Bob Marley and Peter Tosh, I saw another side of music. I saw something other than "Rock Me Baby." I'm just thankful to be where I am today, with my family and my brothers. Q - So you guys have been working on new songs? What should people expect from the new album? What we are going to do first is release like a four song EP, and then a full album will come out later in the year. I think that people will find it consistent to where we are at. We play our blues hard and soft, and we rock it up and everything. It is The Kinsey Report style. Q - You were talking about Bob Marley earlier. What did you admire about him? Him and Peter Tosh both, I admired the fact that they spoke for people's rights. They also tried to bring people together as they talked about one world, one love. I feel very blessed to have been part of that. They had a purpose, and they were on a mission. Q - Besides The Kinsey Report's new album, do you have any other projects you would like to work on? I want to do a reggae tribute album. Reggae is definitely in my blood. And also I want to do an acoustic album of some blues and roots music and stuff like that. I love being creative. It keeps me young. Music is medicine, music is healing. Music is a very powerful thing. Hopefully I can contribute to bringing some peace and awakening. And just make someone feel good, make them feel a little better.